Video: What do you get when you combine a Broadway musical about The Wizard of Oz with two giants of physics? You get "Defining Gravity", the latest music mashup video from A Capella Science. As any Broadway aficionado can tell you, Wicked (the musical, as opposed to the book) focuses on the unlikely friendship between two young girls at school: Elphaba — who grows up to become the Wicked Witch of the West — and Galinda, who becomes Glinda the Good Witch. "Defying Gravity" closes Act I, when the two best friends must go their separate ways. 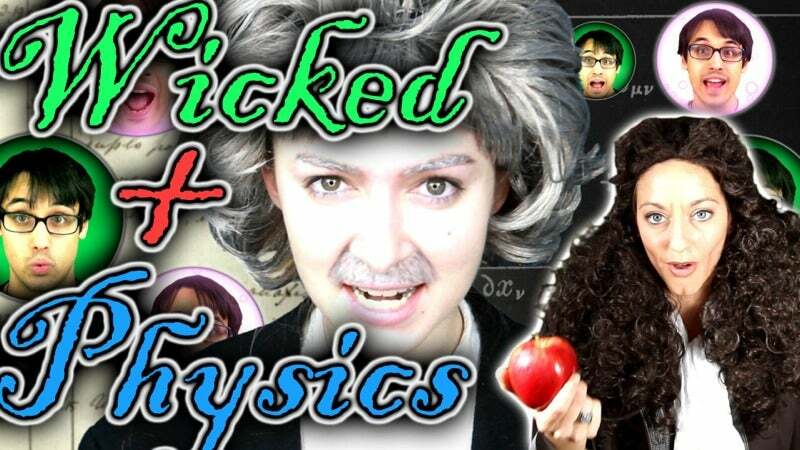 A Capella Science has brilliantly re-imagined this critical scene to focus on the two great physicists behind the theory of gravity: Isaac Newton (Dianna Cowern, AKA The Physics Girl) and Albert Einstein (Malinda Kathleen Reese). The lyrics celebrate how each man changed our understanding of this fundamental force of nature, and Einstein's dream of one day unifying all four fundamental forces in a single theory ("the world around me traced in geometric means").